and the National Gallery of Ireland, Dublin are displayed for free each year for the month of January. This year the annual exhibition of Turner watercolours at the National Gallery in Dublin is complemented by etchings and drawings by Kerry-based master printmaker Niall Naessens. 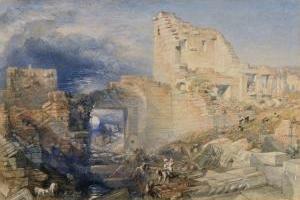 January is the month when the Turner watercolours bequeathed by Henry Vaughan are on display at the National Gallery of Ireland, Dublin and the Scottish National Gallery, Edinburgh . The two paintings below were originally in the Windus Collection.